Like many people, I’ve gotten hooked on George R. R. Martin’s fantasy series, A Song of Ice and Fire (adapted for television as Game of Thrones ). I’m reading it not only as a fan of epic fantasy, but also as a fantasy writer. Whether you like the books or not, there’s a lot to learn from them. 1. Some readers will follow you anywhere…if they trust you. Martin is infamous for killing off characters you thought were safe by the rules (or tropes) of fantasy writing. Granted, he’s lost readers because of it — dark, gritty fantasy isn’t for everyone. But he still has huge numbers of readers clamoring for more. Why? Because they’ve grown to trust his storytelling skills. He’s shown that he’s in control, that his plotting is well thought out, that he doesn’t kill characters without a good reason. More than that, he tells a story that people want to hear, despite the risks. It’s time for another installment of travel tales from my Grand Adventure in Asia. Now that I’m no longer travelling, I plan to post these on alternate Wednesdays, interspersed with the same sort of mental-health posts and personal observations that I was writing before the trip. Mondays will continue to be about books and media (SF&F-focused, but not exclusively), as always. I’ll continue to post twice a week for now. Enjoy! Our first stop in Thailand was Chiang Mai, the country’s second-biggest city. It’s in the northwest part of Thailand, among rolling hills that keep the temperatures down to something very reasonable for North Americans. This means it’s a popular destination, not only for North Americans but also for Chinese tourists, whose numbers have exploded recently due to cheap flights. Our guesthouse, Kamala’s, was on a tiny side street. (Note on addresses: Non-main streets are known in Thailand as sois. Thai addresses give the nearest main road, then the number of the soi, because the sois themselves don’t have names, even though they may be large streets. So Kamala’s was on Chai Sriphum, Soi 1.) 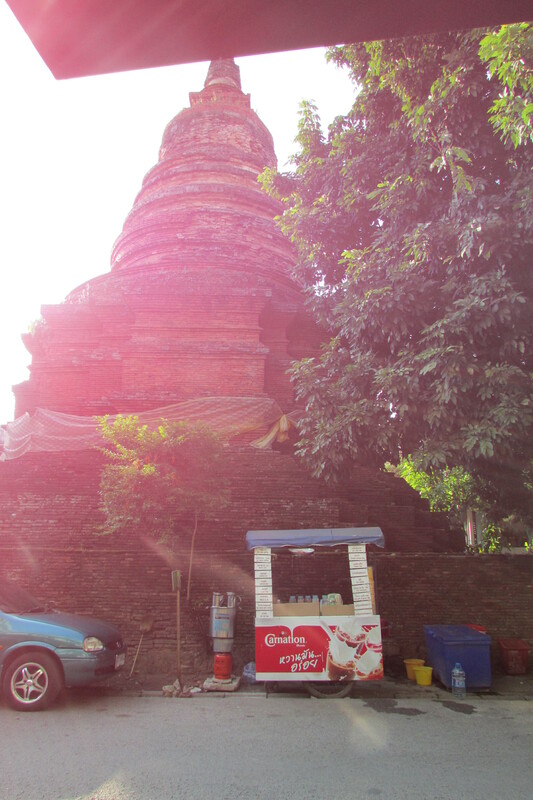 Across the soi was an old Buddhist stupa, a useful landmark since it was visible from several streets away. For those of us growing up in the ’80s and early ’90s, science fiction for teens (the term “YA” hadn’t been invented yet) tended to follow a few familiar tropes. Dystopian tales were popular, as were stories about aliens and spaceships. And it was almost taken for granted that our planet was going to come close to destruction, usually for environmental reasons. If you’re anything like me, you sometimes wish that you could step back and look at your life with fresh eyes. A new perspective on your time spent, your priorities, your living arrangements…what would it look like? 0. We’re lucky to live in a first-world country. There’s a lot we take for granted in countries like Canada. But you knew that, and I won’t elaborate on it, because for the purposes of this post, that’s not what I’m interested in. First of all, my heart goes out to the marathon runners in Boston and all those affected by the events there. It’s horrible to contemplate — so many personal triumphs turned to tragedy in an instant. I’m sending healing thoughts southward as I type. Having said that, I would be remiss in my duties as editor at Turtleduck Press if I delayed this announcement any longer. This month we have a new SF novel out: Captain’s Boy by KD Sarge.